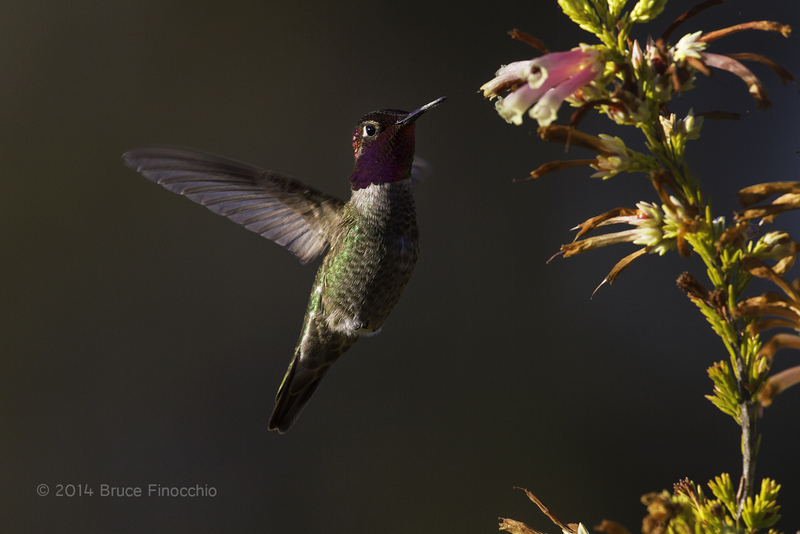 Want to take beautiful Hummingbird images? 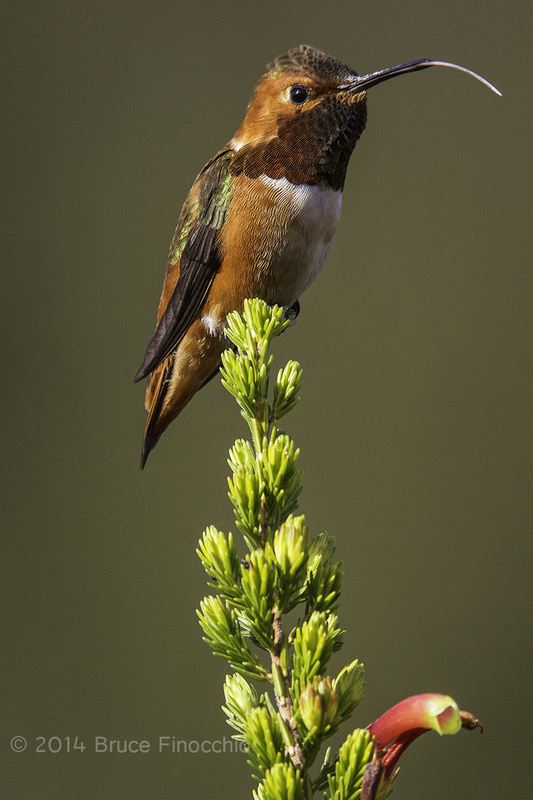 Come with me to the University of California at Santa Cruz Arboretum and I will teach you how to make beautiful hummingbird images. The images on this page were created last year; the Arboretum is alive with activity now. 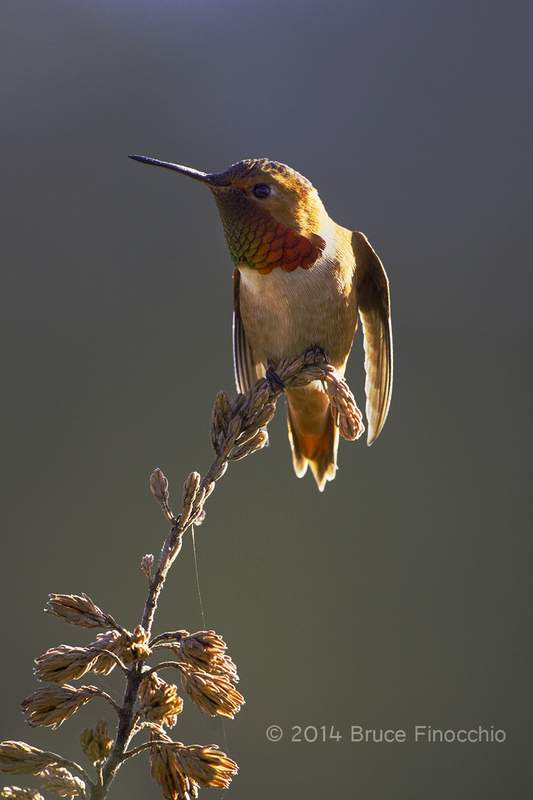 Every year Allen’s Hummingbirds come up from the Coast of Mexico and extreme Southern California to our coastal land in Northern California to bred and mate. 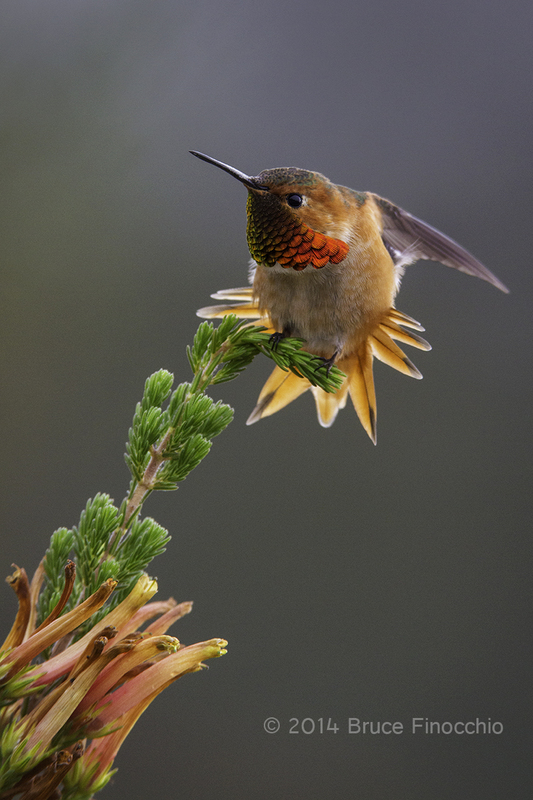 They join the native Anna’s Hummingbirds who they compete with and actually dominate. The UCSC Arboretum with its South African and Australian gardens, especially the grevillea and banksia plants, provide a constant source of nectar for these jewels of the sky. I will share my techniques and field observations with you, providing personal instruction. We will discuss flash, and how I use fill flash in particular to soften normal bright sunlight. Bring on the clouds and diffused light that I love, as well as the magic of low angled sunlight. Flash is important to illuminate the wonderful colors of these jewels of the skies especially for bring out the male’s gorget. After, daylight saving begins on the second week of March, then, morning times provide the best light, so we will start at 9:00 AM and run to 1:00 PM in the afternoon. 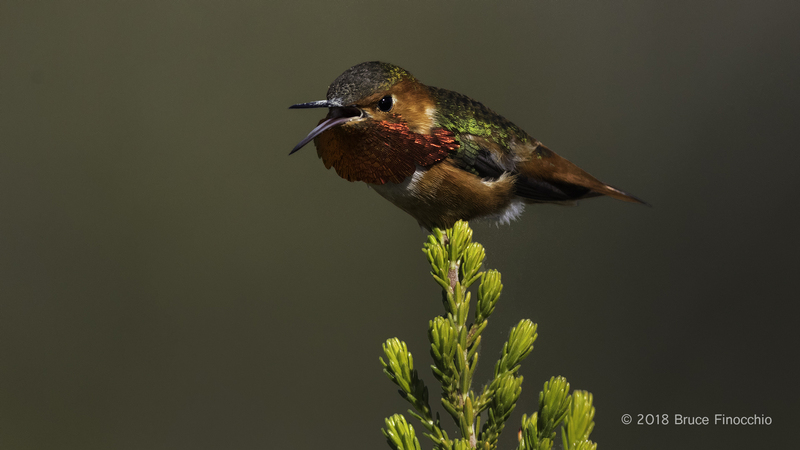 There are different areas within the gardens that I normally shoot at, but each year is different and will depend on the hummingbirds, but as in all wildlife photography conditions and opportunities can change. 300 mm telephoto lens is a minimum requirement, larger magnification zooms lenses are preferable if you don’t have a 400, 500, or 600 mm straight prime lens. Also, a Tripod with a good ball head or gimbal type head like a Wimberley is a must if you want more than just perched or blurry flight images. Although, it is possible to get feeding images just hand holding your camera if you are careful with your technique. 1.4 Tele-converter, 12mm or 25mm Extension Tubes, Cable Release, External Flash, Better Beamer, External Battery Pack, like a Quantum Unit. Right now, I am using two camera bodies, one with my 400 mm IS DO lens hand holding for feeding images, and my 600 mm lens for hummingbirds on perch. A hat that provides shade for your face and you can use to photograph with as well as sunscreen is advisable. Always, dress in layers and wear good walking shoes. Although, not necessary a small folding chair is helpful for taking a rest because we will do a lot of standing. The cost is $99.00 per session. The $5.00 UCSC Arboretum entrance and admission fee is not included, and payable at the Norrie’s Gift and Garden Shop. If you have any questions, you can e-mail me at bruce@dreamcatcherimages.net or call my cell phone at 650-339-2555. I look forward to sharing my passion and knowledge of capturing these beautiful special birds of the Americas. Sign up below to reserve your place, because space is limited to six photographers per event. Hi, I was at the arboretum yesterday. 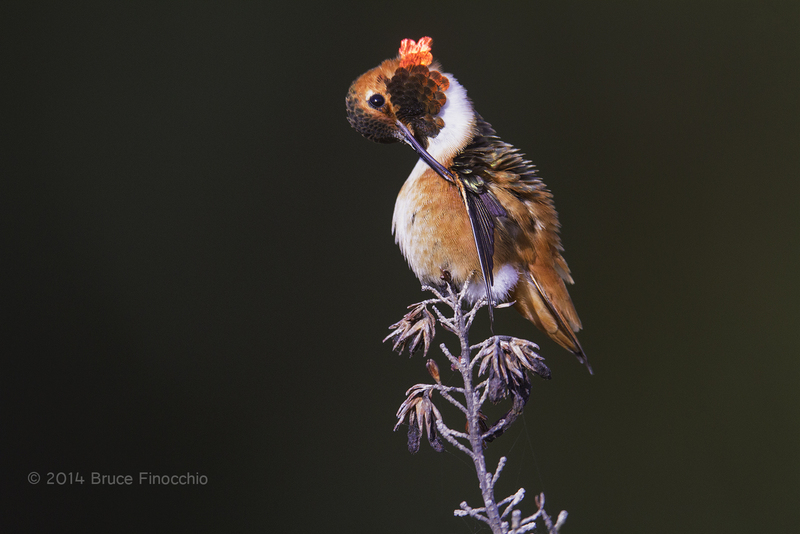 Please post some of the images that you took of the bird perching at the Erica garden. Nice meeting you yesterday, and good luck at the arboretum photographing the jewels of the sky.